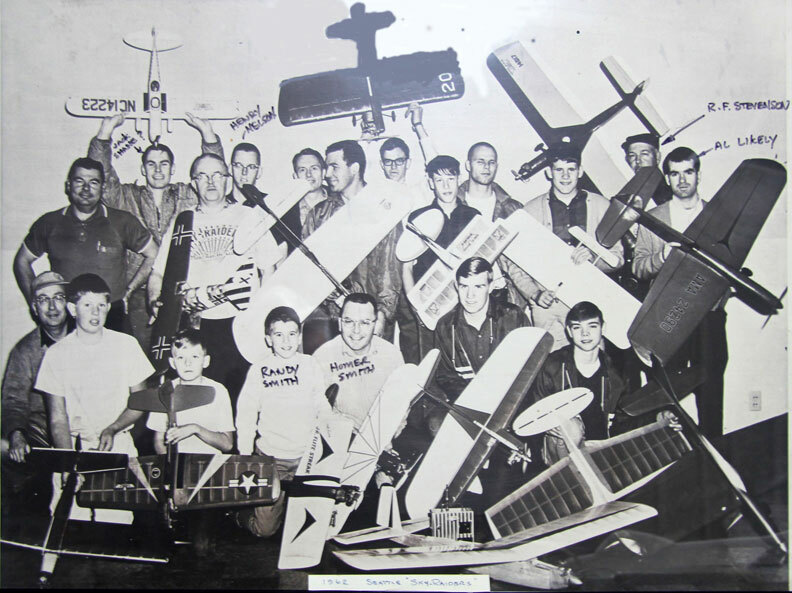 Control-line model aviation in the Pacific Northwest has a long and lively history, going back -- literally -- to the invention of the bellcrank and the first controlled model airplane flights. Here are a few photos from the past. More will be added as recieved from Flying Lines readers. If you have an old CL photograph that would be a candidate for this page, e-mail the photo and the information about it to the Flying Lines editor. Photos submitted in 2007 or before can be found in Northwest CL History Gallery 1. Photo submitted in 2008 can be found in NW CL History 2008 Gallery. The 1962 Seattle Skyraiders included a few well-known Northwest modelers, incluidng R.F. Stevenson, Homer Smith and Henry Nelson. Can you identify any others? Photo provided by Dave Gardner. A giant of control-line modeling history, Lew McFarland, died in late March 2011. He's pictured here with his Shark, photographed at the 1968 Nationals in Olathe, Kan. Don Shultz photo. 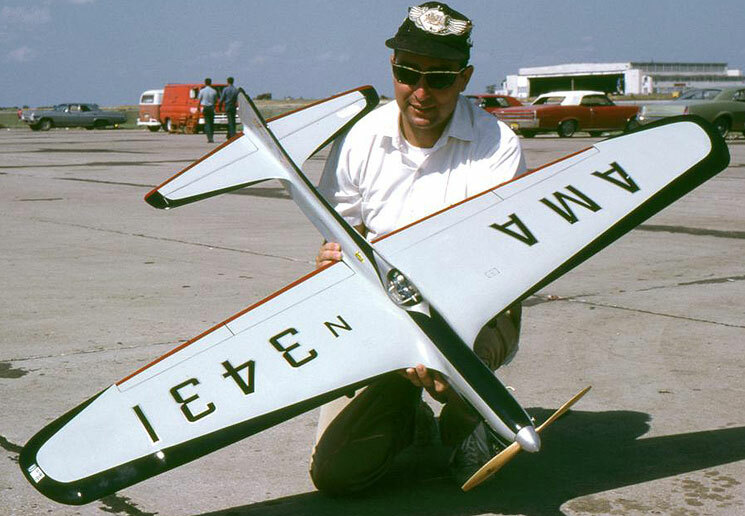 The late Bob Palmer, designer of many classic era stunt planes, attended some Northwest contests in the 1990s. Above, he holds the Thunderbird II built by Don McClave, designed by Palmer in 1959. The original plane won the 1959 Nationals in Los Angeles. 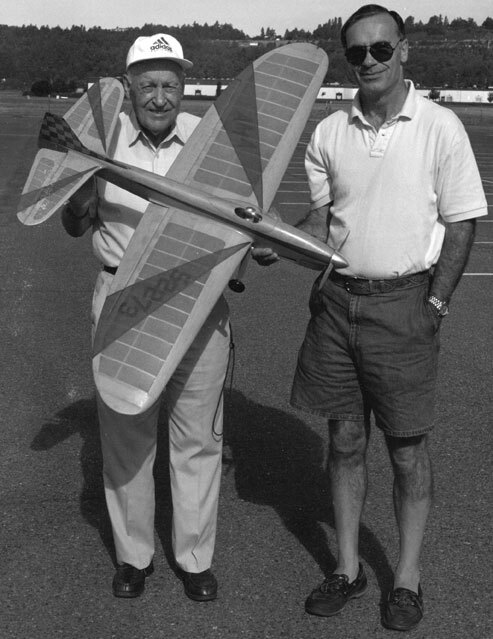 The photo is from the 1995 Stuntathon in Kent, Wash. Don built the pictured plane from plans drawn from Bob's specifications by Bob Emmett. Don flew it to third place in Classic Stunt at the 1995 Nats in Tri-Cities, Wash. The Thunderbird II later became available as a kit from RSM Distribution. Don's version was powered by an L&J Fox .35, weighed 40 oz. and was finished in colored Japanese tissue, yellow with red trim. Gary Letsinger photo. 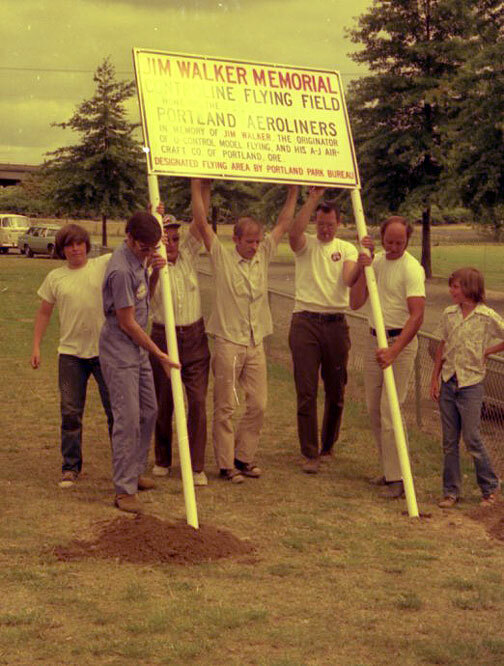 The Portland Aeroliners club put up the sign in East Delta Park in Portland, Ore., which remains there to this day. The photos were submitted by Dave Gardner, who recalls that the event took place in 1974 or 1975. In the photo above, that's Pat Webb in the blue coveralls and Al Zion at the inside of the right pole. 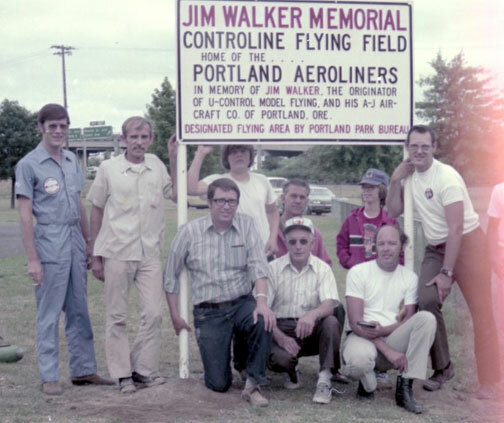 In the group photo below, that's Pat Webb on the left, then Jim Zehrung next to Pat, Al Zion at far right, and Dave Gardner kneeling left, Larry Wilson, kneeling far right and Harry Debuhr, kneeling in white cap. Others are unidentified. Dave Gardner photos. 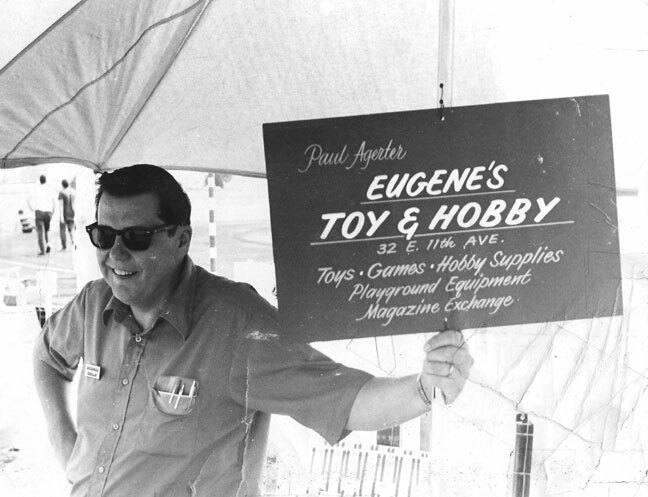 Paul Agerter, longtime owner of Eugene Toy & Hobby, pictured at one of the first Northwest Regionals held in Eugene, Ore., in the early 1970s. Paul was a permanent fixture at the Regionals until his death several years ago. He and other staff members from the hobby shop filled a truck with CL and general modeling supplies for sale at the contest. The tradition was carried on by Paul's sons, Mark and Alan, for several years, and the hobby shop is still a popular stop for modelers attending the annual Memorial Day contest in Eugene. Photo provided by Mark Agerter. Eugene Prop Spinners newsletter editor Jim Corbett was researching club history recently when longtime member Mel Marcum came up with this clipping from a Eugene, Ore., newspaper from 1947. The paper, which no longer exists, reported on the flying activities of the Prop Spinners. The club, which remains active in 2009, has been in operation almost continuously in the 62 years since the article was published. Send in your historic CL photo. All you have to do is e-mail the editor or mail the hard-copy photos to Flying Lines, 2456 Quince St., Eugene, OR 97404.